Hey everyone! Travis back with some Tampa Bay entertainment in one of my favorite areas of Tampa Bay...historic Ybor City! 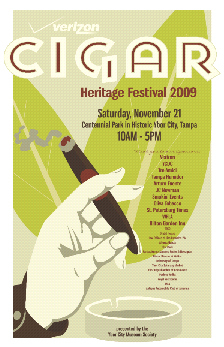 Anyone and everyone can come join the fun and ambiance of Ybor City for a day of activities celebrating the rich cigar heritage that once made Tampa the "Cigar Capital of the World." Join thousands of cigar enthusiasts at the 11th annual Cigar Heritage Festival! You can see master cigar makers Wallace and Margarita Reyes attempt to break the record for "World&apos;s Longest Cigar." The current US Record Holder was in 2006...which was 30.78 meters. I mean, how cool would that be??!! Plus, you can shop the World&apos;s Finest Cigars, including Cuesta Rey, Arturo Fuente, Rocky Patel, Camacho, 601, and many more! Also, there&apos;ll be a Kid Zone, Food Court, Cigar Accessories, Tours of the Ybor City Museum State Park, Cigar Rolling, Live Entertainment, Charity Beer Garden, Authentic Cultural Food Vendors, Cultural Activities For The Whole Family, the Ybor City Fresh Market, and the list just keeps going! And for all of you sports fans, they have you covered too, because there&apos;ll be a Game Zone featuring NCAA Football, Poker, Dominos, & More! It all happens in CENTENNIAL PARK in YBOR CITY (on 9th Ave. between 18th and 19th Streets). It&apos;s tomorrow from 10am to 5pm, so make plans to stop by during the day! You can bet you&apos;ll see me out there. Have a great time everyone! And keep checking back here for other Tampa Bay area events and other great things to do in Tampa Bay!